Meghna Wins ChampChild November Mid Contest. Here is what published in the Champchild website. 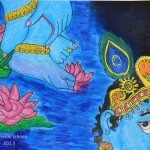 Meghna’s winning picture of Lord Krishna.